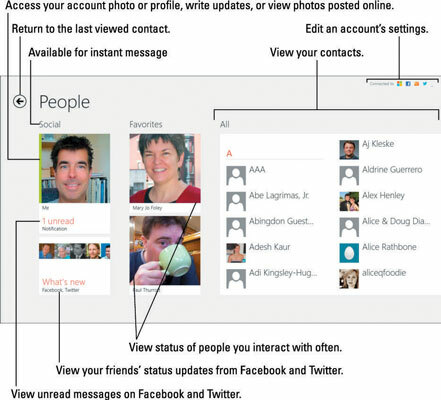 After you link the People app on your Windows 8 tablet with your online social networks, your People app stocks itself with your favorite people, whether they’re on Facebook, Twitter, LinkedIn, or other networks. Open your People app with a tap on its Start screen tile, and the People app appears, listing all of your friends it grabbed online. In keeping with the latest computing trend, People alphabetizes your contacts by their first names. Your friend Adam Zachary finally appears first. The People app keeps itself updated automatically, adding and dropping people as they enter or leave your social networks. However, some people don’t share their lives through a social network, which leaves them out of the People app’s virtual reach. Also, networks like Facebook contain huge switchboxes full of privacy controls. Some of your friends may have flipped a Facebook switch that keeps their information sequestered in Facebook’s walled garden, and away from the clutches of the People app. The point? You’ll eventually need to remove your gloves and manually add or edit entries in the People app. This section explains the details of a job that can’t be sloughed off to the People app’s robot crawler. Tapping your way through the People app can lead you to friends, their adventures, and even the adventures of your friends’ friends. If you’re feeling lost in a sea of people, slide your finger up from the tablet’s bottom edge and tap the Home button. That takes you back to the front page. When anybody is available to receive an instant message, a thin green bar appears along their picture’s left edge. To make yourself Invisible — unavailable for instant messaging — open the Messaging app and change your status to Invisible.